Of course, Mirror (see previous post), is not the only film about dachas, families, the Russian summer and the intersection of private lives and public events. So is Burnt by the Sun, made over twenty years later. That film, made after the fall of Communism, is a bitter story about how Stalin’s Terror intrudes on the life of a family gathered in their dacha – if you are unfamiliar with the film see the plot summary on Wikipedia. It is not a corrective to Mirror, nor even an antidote, but it is a striking contrast. Personally, I am of the opinion that Mirror is the greater film, but many would prefer Burnt by the Sun. Filming the Middle Ages is a difficult thing to do, to my mind. I think of the fantasies of Ken Russell’s The Devils and Laurence Olivier’s confected Henry V. Perhaps the British are bad at it. Or perhaps it shouldn’t be done in colour, but I then think of Rossellini’s Age of the Medici which works well. Even so I do think black and white is better. The most notable example is Dreyer’s Passion of Joan of Arc, which finds a visual essence for the period that does not detract from the main Passion narrative. Or think of Orson Welles’s depiction of the Battle of Shrewsbury (1403) in Chimes at Midnight: a mass of scrawling, heaving armour in a muddy field – surely this is a real insight into the Middle Ages. This train of thought, trivial as it is, was prompted by watching Marketa Lazarova, a film made in Czechoslovakia in 1967 and directed by Frantisek Vlacil. This is a black and white film revelling in the awful cruelty of mediaeval Czechoslovakia, although whereabouts exactly I never found out: wet when it wasn’t snowy, and of course murderous. It even had hungry wolves roaming about. God knows what was going on – if you see it I strongly recommend having the synopsis from Wikipedia to hand. Despite this narrative incoherence it was compelling, or rather ‘hallucinatory’ (in the words of the Time Out Film Guide). What is more Vlacil makes astonishingly clever use of his letterbox format, often having a figure in the centre balanced with other action within the frame. Seeing its black and white quality, its visual ambition and its narrative discontinuities made me think of Tarkovsky’s Andrei Roublev, but I don’t think there is any question of influence one way or the other. The first script for Roublev was published in ‘Isskustvo Kino’ in 1964 and approved for production, but the film’s troubled post-production meant it was not shown at Cannes until 1969. As Robert Bird remarks: “[Early-Muscovite Russia] is shown mired in cruelty, famine and internecine strife, with a repressive church cajoling the fun-loving pagan masses.” Apart from the Church bit (although it does have an obnoxious bishop), Marketa Lazarova could well be described in the same terms. Could Vlacil have been inspired by reading the script in ‘Isskustvo Kino’, or as a fraternal Czech was he in the know with Mosfilm who were responsible for Roublev? I was very taken with his horse in the forest, a very Roublev-ian image. Somehow none of this is very convincing, and in fact Marketa Lazarova stands on its own feet without reference to Roublev. What they both share, apart from both being very long, is a common memory, that of the struggle on the Eastern front in World War II where you either resisted or collaborated, and anyone in the middle got crucified. This is well brought out in Loznitsa’s In the Fog, and it is true also of the situation in the Czech film. Marketa does survive because she’s a woman. 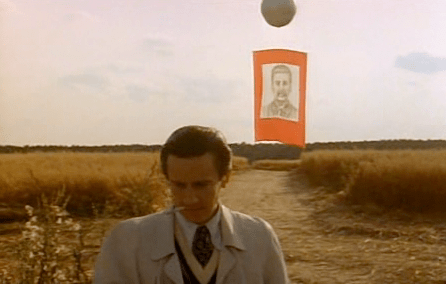 In Tarkovsky’s film Roublev survives because he’s a monk and a painter, and Tarkovsky is keen to emphasise how religion and art can transcend suffering. A signpost to Tarkovsky’s conception of the film is the working title given initially to Andrei Roublev: ‘The Passion According to Andrei’. This is in the end a film about the redemption of the world, whereas Frantisek Vlacil’s purpose is to portray a Darwinian struggle for competitive advantage. At the end of it, the narrator comments on Marketa’s life beyond the ending of the film: her two sons, one natural and one adopted, “grew up to be fine boys but love and certainty fought with cruelty and doubt for their souls”. This suggests something unresolved, which was a conclusion emphatically avoided in Andrei Roublev.